Home 2018 April 09 Blog Hungary and Viktor Orbán say “NO!” to White Genocide! Most white Americans would be surprised to learn that there’s a country in Europe whose newly reelected third-term prime minister has been leading his nation in standing firm against White Genocide. NGO’s [non-government organizations] in Hungary that work on behalf of continuing immigration into the country, and are funded in part by donations from abroad, were given a heavy tax in Orban’s preceding term. The Trump administration could similarly take action against the army of NGO’s in this country who not only violate the law in paying no taxes despite their political activism in immigration and other policy areas, but also actually receive Federal funds in order to violate the law! Find them, fine them and tax them, Mr. President! Support and emulate Viktor Orban and his people who have said NO to White Genocide. Prosecute all organizations in the U.S. who violate their tax-deductible status by supporting White Genocide. The anti-white proposition: There can be no all-white countries and there can be no all-white areas in formerly all-white countries. If the anti-white proposition breaks down, it’s a new ball game. The white race(s) need homelands where they can preserve themselves, just as other races have. After whites’ homelands have been made non-white, the races that anti-whites have used to blend whites out of existence or reduce whites to tiny ill-treated minorities will remain intact in their own homelands in Asia, Africa and elsewhere. 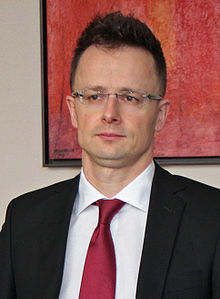 A recent BBC interview with Hungary’s foreign minister Péter Szijjártó.